Disclaimer: In this post, we will be discussing restricted ranges of motion and “tightness” with a standard stretch for CrossFitters, the couch stretch. In a Sports Therapy/Chronic Pain Resolution practice, diagnosing necessitates further detail in order to figure out why a tissue is restricted. Tissue can be 1) adhesed, 2) protectively tensioned or contracted, or 3) blocked by a space-occupying lesion. For the purpose of this post, we are assuming the restriction is caused by mild, local 1) adhesion and nothing else. Conventional wisdom’s answer of “stretching” for the problem “tightness” is leaving many people hopeless of how to increase range of motion and is grossly missing the mark. We will discuss this in a later post. In the CrossFit world, there are more and more doctors, therapists, and coaches giving out blanket mobility prescriptions intended to reduce symptoms, diminish risk of injury, and improve performance. Typically, googling “knee or hip tightness” will result in blind treatment protocols of “what might work” given all of the tools in a practitioner’s toolbelt. If a prescription gets you results, wonderful! Keep doing it. It must be working. If it gets you no results, stop wasting your time and don’t to it any longer. What stretch you should do for that tissue for the purpose of providing you a bang-for-your-buck solution to potentially pursue your restriction and, most important, GET YOU RESULTS. This can not be overstated enough. Let’s be pragmatic. What is the Couch Stretch doing? Albert Einstein is famous for saying the above quote praising simplicity where warranted. The Couch Stretch is not one of those places. 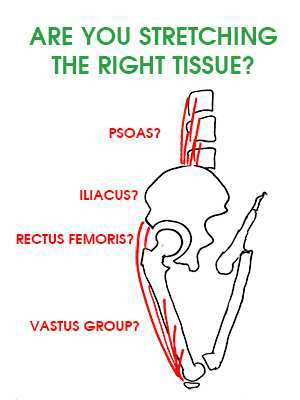 There are six muscles that need to be examined in hip/knee flexor anatomy. Their general biomechanical function is listed after the muscle. Psoas: Lumbar stabilizer and hip flexor. 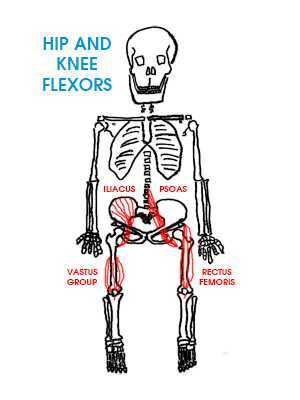 Rectus Femoris: Hip flexor and knee flexor. Each muscle is tested for pathology and restriction in different ways. Based on the function of the Homo sapien mechanical system, each test has a normal range that allows for the body to function given what a Homo sapien may have to do in life. Having that range is a PASS for that test. Anything less than that ideal range is a FAIL and leaves you at risk for further injury, damage, and compensation, causing a downward spiral of your body hating you. Therefore, the biggest impediment towards you living the life you want to live when it comes to your body is addressing your restrictions. Below are the Baseline Functional Tests that will let you where you are at risk of pain or injury, if you’re not in pain already. If you don’t know how to test these, we will go over this in a later post. Lunge Stretch Test | Kneeling Hip Extension – tests the psoas and iliacus – learn how to perform the lunge stretch here. Supine Knee Flexion – tests the vastus medialis, intermedius, and lateralis. 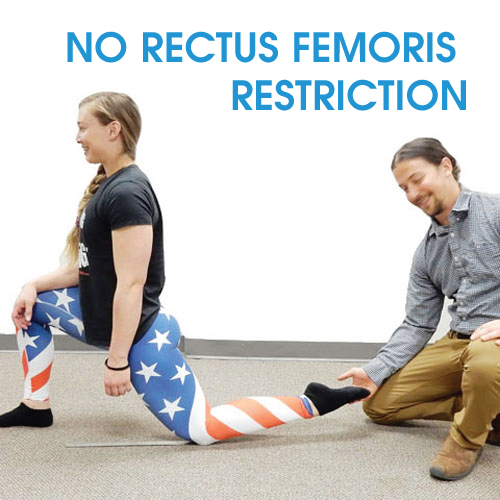 Selective Tension the Knee – tests the rectus femoris by adding Knee Flexion to the Lunge Stretch Test – learn how to perform selective tensioning of the knee here. Touch Your Toes Test | Standing Lumbopelvic Flexion – tests the lumbar spine, hip, hamstring, and sciatic nerve complex and more importantly for our purposes here, where a disc (or other structural pathology) may be Red-Lighting (protectively tensioning) your other tests. Learn how to perform the touch your toes test here. PASS = touch the ground with extended knees in less than one second. FAIL = anything less than touching the ground and taking more than one second (unless really sore from a workout). Before we give you a new prescription, we need to collect a minimum amount of data to figure out your precise pathology as determined by what is restricted. At Barefoot Rehab, we love the metaphor of building a house for building your body. By testing your musculoskeletal mechanics, we are seeking out restriction that exposes pathology, which are “nails”, or problems that need a “hammer” in order to fix. The reason why the Couch Stretch is not working for you is that are addressing the wrong problem, trying to screwdrive a nail when you really need a hammer. In other words, we’re going to match your restriction with the right tool to address that restriction. How long have you been doing the Couch Stretch for? Has it increased your range of motion? If yes, good, keep going until full. 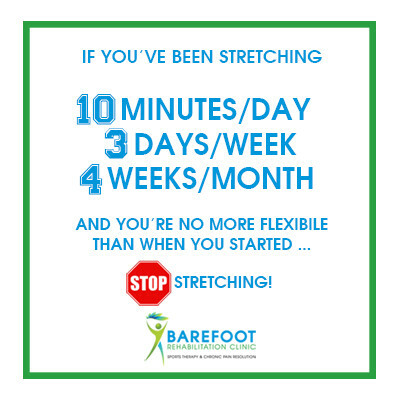 If no and it has been a month of stretching, stop wasting your time. 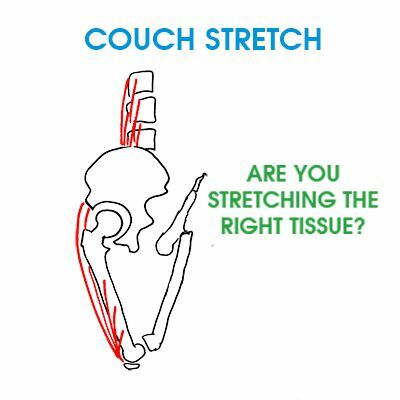 What has your experience been with the couch stretch? What have you tried? How long do your effort’s effects last?